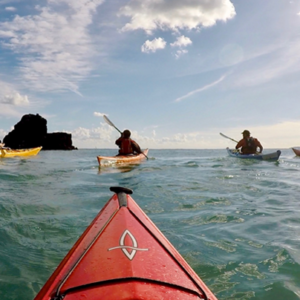 A Sea Kayak is the perfect craft to let you get to a beautiful camp spot at the waters edge in the stunning Dart estuary or on a pristine beach in a quiet sheltered cove. After an exhilarating day out exploring the coast there’s nothing better than relaxing on a beach with a cold beer listening to the sausages sizzling on the BBQ. There’s plenty of space in the kayaks to be able to pack lots of gear so that you can camp in style and eat lots of delicious food. 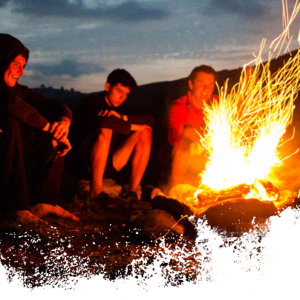 There is so much to do and discover on a wild camp and both kids and adults will have a great time. We teach you how to light a driftwood campfire with a flint and steal so you can roast marshmallows and if you’re lucky you might even be able to use the camp fire to cook any fish you catch. Evening entertainment might include building cool rope swings in the trees, rock skimming competitions, playing frisbee on the beach or jumping off the rocks into the sea. We provide everything you could need to be very comfortable on your kayaking holiday for the 2 days. As well as your kayaking kit we also give you all the camping gear that you’ll bed: tents, inflatable camp mattresses, head torches, cooking equipment. To store your personal evening clothing and any other gear you want to bring, we give you as many dry bags as you need. One of the highlights of your trip will be the delicious food. It’s all prepared by Kay who before joining the Sea Kayak Devon team spent many years working as head chef at an exclusive wilderness expedition centre. Everything is home made to order and to the highest quality. Putting together a feast on a beach is great fun and our kayak guides are all experienced expedition cooks. They’ll be their to take charge of the cooking and help you learn new tricks for living in style in the wild! You can turn up in shorts, t-shirts and flip-flops and we’ll sort the rest! However to get the most out of your trip please bring a warm set of outdoor clothing for the evening, a pair of shoes or sandals that you didn’t mind getting wet, a sleeping bag (we can lend you one if you don’t have your own) and a bottle of your favourite wine or beer! We provide all the camping gear but you are very welcome to bring any cool gadgets, penknives etc. of your own. HOW MUCH CAN THE KAYAK CARRY? The beauty of travelling by kayak is that weight does not matter, in fact it can often make it feel easier and more stable! There is approximately 120 litres of dry storage in each kayak (a big expedition rucksack is about 90 litres). In addition to this there is about 50 litres of non watertight storage on your deck and in the kayak cockpit. Remember the hatches to the dry storage compartment are not big so you can’t put a big rucksack directly into the kayak. We provide you with as many dry bags as you need for your personal gear.